Shenmue is the first game in the Shenmue series. Ryo Hazuki travels through Yokosuka, Japan in 1986 for information about the man who killed his father. It was released in Japan on December 26, 1999, in North America on November 8, 2000, and in Europe on December 1, 2000. 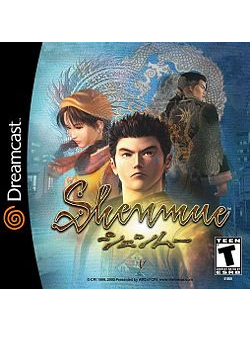 A high definition version of the game was released, packaged with Shenmue II, by Sega for Xbox One, PlayStation 4, and Windows, on August 21, 2018. The game began as a 1995 prototype for Sega Saturn, entitled The Old Man and the Peach Tree. The prototype addressed some of the problems that Yu Suzuki saw in role-playing games (RPGs) of the time, such as players continuing to walk when they bumped into walls and the inability to talk to non-player characters without facing them. The Old Man and the Peach Tree was set in the 1950's, and followed a young man named Taro who traveled to the city Luoyang in China in search of a kung-fu master named Ryu. One of the cinematics had a man skipping rocks across a lake, hitting a fish with every skip, sometimes hitting two or three fish with one stone. After seeing this, Taro was certain that he had found Ryu. In 1996, Yu Suzuki began creating a Sega Saturn RPG based on the Virtua Fighter engine. It was a Virtua Fighter RPG that was still set in China, with the plot centered around the fighter Akira. It was to be told in four acts: sadness, departure, fighting, and beginning anew. The story was to tell Akira's loss of his father, which led to him travelling to China to fight in a heroic battle, then chronicled his journey beyond that. He brought in a movie director, a playwright, and a screenwriter to create the story. 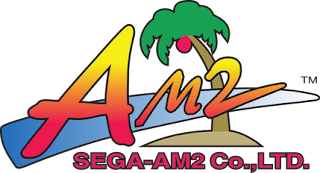 The team developed a plan for eleven chapters, but never developed it beyond a prototype as they opted to target Sega's newer system, the Dreamcast, instead. The game began under the codename Guppy, then became known as Project Berkeley, and finally was given its final title (named after a cherry blossom tree in Guilin, China) Shenmue ~Chapter 1: Yokozuka~. The original plan was for each of the eleven chapters to come out in separate games for the Dreamcast. When the game didn't nearly come close to making up its 47 million dollar development and marketing budget, it became clear that Sega could afford to make eleven Shenmue games. Thus, while the first Shenmue contained only one chapter, Shenmue II (released for Dreamcast in 2001 and for Xbox in 2002) contained three chapters. The series won't be continued until Shenmue III is released for PlayStation 4 and Windows in 2019.